This vertically oriented landscape is an early work by Harpignies that was painted near Marlotte, a small village southeast of Paris and on the edge of the Forest of Fountainbleau. An heir to the traditions of the Barbizon painters who worked in this region, Harpignies painted this landscape en plein air, or outdoors, as many Barbizon painters did. We are certain of this by the inscription written in the hand of Harpignies on the reverse side of the canvas which reads: “faite d’après nature” (painted from life). As a result, this landscape is fresh and direct. The two advancing figures, probably a father and son, animate the idyllic scene. 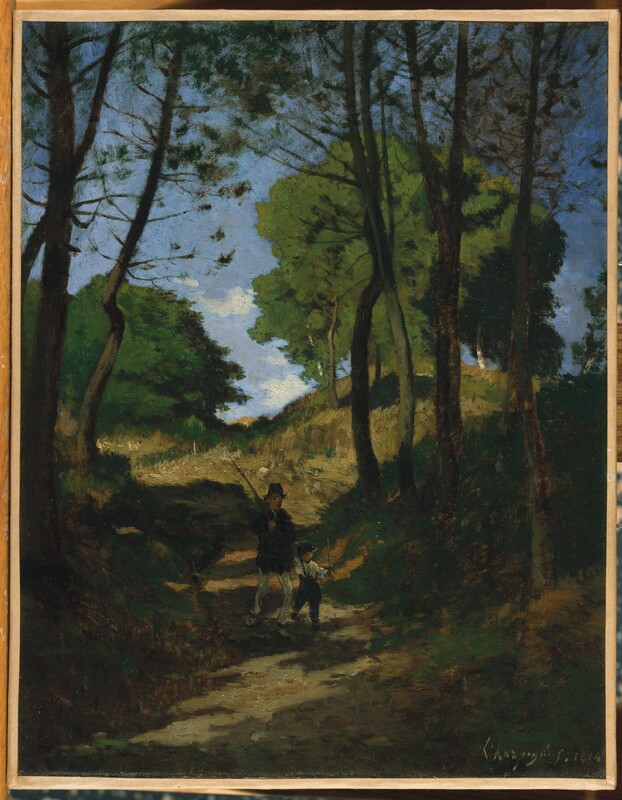 The fir trees that fill the shaded foreground extend vertically beyond the canvas and frame the figures, creating a receding passageway to the golden hills and crisp, sunlit sky of the background.